Projects are the core business of EURIPIDES². The EURIPIDES² Board is granting the label twice a year. 84 projects worth 461 million Euros in R&D have been labelled under EURIPIDES and EURIPIDES² (2007-2016). All running and finished projects are listed below. POSTNE+ strives to measure, analyze and improve the fault-related energy consumption in telecom operator centers, targeting a 4,11% reduction. A smart electronics system will be developed to collect key energy indicators (active-reactive power, total harmonic distortion and environmental conditions within the venue of the infrastructure and the exterior, by using sensors to measure temperature, humidity, air flow, air particle density, water, gases, etc). SAFER is aiming to innovate in drone technologies and develop smart sensing solutions for the agriculture sector. While the validation will be with potato fields, the plausibility could be extending to a wide range of smart farming scenarios. Implementation of those technologies to the pilot potato fields will enhance and optimise the growth of the agricultural product, in a resource efficient way, cutting down on the usage of water, fertilizer, and human capital. AR2SP4SPI will develop a smart pentane sensor enabled by artificial intelligence (AI) responses to the detected pentane C5H12 gases in the industrial settings of polyurethane foams production. DIGIWINE aims at the development of monitoring and data acquisition systems to help digital transformation of the wine industry through the application of advanced connected optical technologies. Through the development and the implementation of of IoT optical sensing platforms, and communications and data transmission architecture, DIGIWINE will achieve an effective digital solution to be implemented in the wine production process. IMASE will develop an innovating technological solution for industrial locks. The innovation will be based on the visible light communication (VLC) technology, one of the sophisticated ocular wireless contact technologies inculcates light in the visible spectrum (375nm to 780nm) as a mean for data transference. ESSGIAS endeavours to develop a smart electronics solution that could be widely applied in the automotive seat industry. The technology offers utilizing automatic regulation in order to achieve a gradual periodic pressure change. This periodic changes occurs seamlessly, without the notice of the passenger, and even may naturally help to circulate the blood pressure in the seated traveller’s legs. The innovation is delivered by means of an electro-pneumatic system. APESE is developing smart electronics to serve the improvement of Key Performance Indicators (KPIs) in automated production plants based on a Digital Twin approach. SAP4MA aims the development of a printed active device using nanomaterials to produce smart packaging solutions for margarine targeting the extension of the shelf-life of the packed margarine through the controlled release of active natural antioxidant agents at the onset of the food degradation process. The aim of 3DP@ESCI is the adaptation and development of three dimensional printing equipment with application in candy industries in Europe wide, with the main goal of preserving the control quality of such food and decreasing the time of their preparation through the reduction of the necessary steps to allow their consumption. MARS targets the creation of self-sensing probes integrated with optical detection system for enabling different SPM modes and techniques. The developed probes consist on two complementary techniques NTR and Cantilevers with piezo resistive readout. The main objective is to improve the flexibility of the SPM to wide-range of scanning modes, materials and environments. IS4SE is developing industrial sensors and the relevant artificial intelligence (AI) models to serve for the improvement of Key Performance Indicators (KPIs) such productivity and safety in automated production plants. EDISOHCS focuses on developing and applying innovative approaches in functions such as sensing meals, drinks and dining environment, transferring imagery data and performing near-real time analysis to communicate key information to staff and generating advises regarding the observed food and availability of tables and chairs. The project builds on in-house developed hybrid technology platform, as a cloud-based operations management for cafes, restaurants, bars and similar venues. SR4SR is developing a cross-cutting system based on smart electronics to apply to biotechnological downstream processes. It will consist of a multi-functional robotic device equipped with sensors to actuate a wide range of biotechnological process. SPDMD strives to measure, analyse and improve the energy consumption in data centers, targeting a 6% reduction. A smart electronics system will be developed to collect key energy indicators (active-reactive power, total harmonic distortion and environmental conditions using sensors to measure temperature, humidity, air flow, air particle density, water, gas (CO, CO2). HARPSENS will develop CYCLOPS and Smart Vest to become a full-fledged enabling technology for Industry 4.0 applications and a platform to build upon that is affordable and accessible to all industrial users while providing solutions for process enhancement in all major industrial settings. VLC4AS is developping an innovative technological solution for vehicle-to-vehicle communication. The innovation will be based on the Visible Light Communication (VLC) systems, a wireless optical communication technology which makes use of the Solid State Lighting devices, more commonly known as LED lamps for data transference. AI@PP aims at developing Bluetooth and sensing devices LoRa related to artificial intelligence (AI) models to serve for the improvement of Key Performance Indicators (KPIs) such as time, energy consumed, final product quality in automated production plants. INGENISENSE project aims to create a framework for developing smart sensors to easily operated and a cloud-based platform for Big Data infrastructure management and provisioning Machine Learning applications as reusable assets. The aim of this project is to build a Smart Integrated Platform for the needs of inner-city Public Transportation Bus Fleets and additionally propose open communication standards for on-board component interfaces and back office services. The technical goal of the proposal is to develop a novel ultrafast laser-based manufacturing process for flexible electronics which are believed to be the key component of our daily lives in the next decades. Using new technologies, we will develop the flexible digital X-ray imaging system by developing new flexible scintillator film with high resolution, flexible organic photodiode and solutionbased oxide thin film transistor array with high performance on the flexible substrate at low process temperature. - Define design methodology compliant with automotive constraints including thermal, EMC, Mechanical simulations and layout methods & tools using 3D eCAD environment. A successful SA M3 project will improve the capability of the semiconductor and system suppliers (Infineon, STMicroelectronics, Bosch, and Thales) to avoid defects and failures during product development based on better material understanding. The results of material characterization, failure analysis and reliability testing provide the basis for direct improvement of technological process steps during system development and device manufacturing and thus also reducing field returns. The PAMIAQ Project aims to the development of a new kind of Particle Matter sensor suitable for applications in mass markets for PM10 and PM2.5 detection. Innovative heterointegration is planned to realise on-chip integration of IC, MEMS, 3D MicroFluidics. Develop an Advanced Onboard Data Recording and Analysis System which will be used as a recording, monitoring, and alert system for improving human, vehicle and road safety on railways. 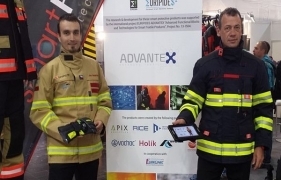 ADVANTEX is focused on bringing more safety to workers facing hazardous conditions such as fire fighters, workmen in waste and recycling industry, ironworks, foundries or glassworks by development of smart protective clothing with integrated sophisticated microsystems. The microsystem is able to monitor physiologic functions of workers, detect dangerous gases in the environment and measure temperature and humidity inside and outside of the protective clothing in order to monitor heat capacity (heat stress). Development of an original CPV (Concentration PhotoVoltaic systems) cells in an intelligent lightweight small micro system easy to move and to instal, with high integration scale and low cost package. This new smart device is aimed at autonomous fixed or mobile stand alone applications to ensure their energy autonomy.